REWARD FOR EFFORT (AUS) (Bay 2006-Stud 2011). 4 wins-2 at 2, MRC Blue Diamond S., Gr.1. Sire of 289 rnrs, 164 wnrs, inc. SW Gold Symphony (MRC Vain S., Gr.3), Ability, Brugal Reward, Take Pride, Blondie, Dalradian, Desert Lashes, SP Gratwick, Tuff Bickie, Fancy Rumble, Sheriff John Stone and of Effortless Reward, Hell of an Effort - D'Great Effort (Mal. ), Jevilla, Montana Star - Star Superior (H.K. ), Petite's Reward, Copy Boy, Fully Maxed, etc. Cash for Matt (g. by Dash for Cash). 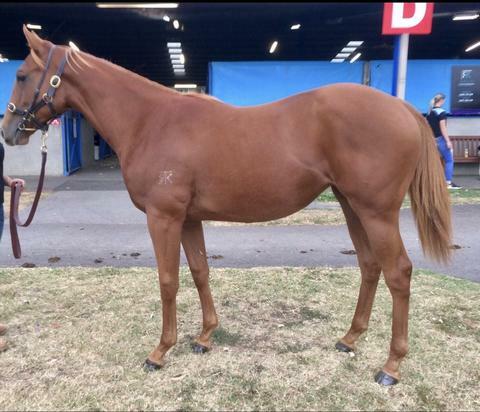 Placed at 2 & 3, 2d VRC Talindert S., L.
Rhiannon's Joy (f. by Dash for Cash). 4 wins from 1300m to 2050m, A$76,359 in Aust. Calm Under Fire (g. by Soldier's Tale). Winner at 2100m in Aust. Victorious Tale (f. by Soldier's Tale). Winner at 1600m in Aust. Milenka (f. by Bianconi). Winner at 2050m in Aust. De Vonic (g. by Von Costa de Hero). Placed at 3 in 2017-18 in Aust. Little Miss Toffee (f. by Toorak Toff). Placed to 2017-18 in Aust. TESTA MY PATIENCE (Testa Rossa). 7 wins from 1300m to 1600m, A$354,789, MVRC Crystal Mile H., Gr.2, MRC BMW H., 7 Eleven Cath White Memorial H., Patinack Farm H., Cove Hotel H., Le Pines Funerals H., 2d MRC Heath S., L, VRC National Jockeys Trust H., Shaftesbury Avenue H., 3d MRC Pin & Win for Epilepsy H., 4th MRC Victoria H., Gr.3. NINETYFIVE EMPEROR (Rory's Jester). Champion 3YO & 4YO in Singapore/Malaysia in 2003 & 2004. 14 wins from 1000m to 1600m, S$1,182,496, Singapore TC Lion City Cup, L, Tiger Beer Triple Challenge No.3, L, Tiger Beer Triple Challenge No.2, L, Kranji Sprint, L, Silver P., L, Stewards' Cup, L, Three Rings Trophy, L, Fischer S., L-twice, Open H., Benchmark 78 H., 2d Singapore TC Patrons' Bowl, L, Star Prince Challenge, L, Juvenile Championship H., Class 1 H., 3d Singapore TC Jumbo Jet Trophy, L, Class 1 H., 4th Singapore Derby Trial, L.
Artie's Son. Winner at 1600m in Aust. Got That Glint. Winner at 1000m in Aust. Composure. 5 wins. See above. Rubino Veloce. Winner at 1600m in 2017-18 in Aust. Unknown Lady. 2 wins at 1000m, 1200m in Aust. Entente Cordiale. 5 wins. See above. Familiar Tycoon. 3 wins to 1400m, 2d TRC Sydeston H., TTC Federal Rewards Club H., 3d TRC Raine & Horne Sorell H., TTC TA Bricknell Memorial H., Onesteel H., Affair to Remember H.
Academix. 2 wins at 1100m, 1200m in Aust. Sally Splash. Winner at 1100m in Aust. Producer. UNCLE SID (Marquee Star). 6 wins-1 at 2-to 1200m, A$92,965, VRC Moomba P., Gr.3, SAJC Lord Rocky Red H., VATC Blazing Saddles H., Green Acres H., VRC Doxa Foundation H., 3d VRC Bobbie Lewis H., Gr.3, Debonair S., L.
Worowatti. 17 wins-1 at 2-from 1000m to 1600m, VRC Provincial P., 2d MVRC Country Trainers P.
Matternot. 11 wins-1 at 2-from 1000m to 1600m, MVRC WH Stocks H., VRC Maybe Mahal H.
Von Puttkamer. 5 wins from 1850m to 2600m, SAJC Del Mar Graduation S., Graduation S.
Starduster. 11 wins to 1250m, A$118,485, SAJC Bellition H., Irish Heiress H.